When a metatarsophalangeal joint sprain occurs in the big toe, it is deemed a “turf toe” injury. This occurs when there is hyperextension of the toe wither from an acute jam of the digit or overuse of the joint from repetitive pushing off. It is a very common injury in football players due to the artificial turf causing feet to stick easier and leading to jamming of the big toe. Two to three weeks is a typical recovery period for turf toe, with constant ice, elevation, and compression of the joint as typical treatment. Kinesiotape can aid in speeding up the healing time. Due to the nature of the joint, a modified approach is taken to taping it. A thin, shorter strip of tape first wraps around the joint, followed by a longer, thin strip that stabilizes the toe from the bottom of the foot. Staying in the lower extremities, this week we examine taping options for pain felt in the ball of the foot, right behind the toes. This area usually produces pain as a result of overuse, improper or worn out footwear, weight gain, and nerve issues. It is important to help stabilize and support the balls of the feet because they are utilized during the toe-off portion of the gait cycle, or when you push off the toes to engage in forward motion. KT Tape instructs us to use two smaller pieces of tape with their ends rounded off for increased longevity along with a regular strip of tape that runs the length of the bottom of the foot. The calf muscle consists of three separate muscles and leads into the Achilles tendon. The three muscles are the gastrocnemius, plantaris, and soleus. This muscle group’s main function is plantar flexion of the foot, or the act of planting and pushing off with the foot during walking and running. Majority of calf strains occur in the gastrocnemius part of the muscle and usually happens when jumping or suddenly changing directions. KT Tape’s approach involves two regular strips of tape that start at the Achilles tendon and run outward both laterally and medially. Rocktape focuses one regular strip of tape down the center of the muscle with a shorter tape that is positioned perpendicular to the first across the largest part of the muscle. Both are effective in stabilizing and supporting the calf muscle. The plantar fascia is a band of ligament that connects the heel to the toes. Plantar fasciitis is inflammation of this structure and is the most common cause of heel pain or pain in the bottom of the foot. Athletes such as runners and basketball players frequently suffer from this condition but it can occur for a number of structural reasons. People who have high arches, flat feet, or excessive pronation (inward roll of the foot) can all develop plantar fasciitis. Symptoms include sharp stabbing pain that is worse when trying to stand or walk. Frequently, the pain is worse in the morning with the first few steps. A common home remedy for plantar fasciitis is rolling a frozen plastic bottle of water under the arch of the foot to help decrease the inflammation with ice and stretch the ligament with the rolling motion. Stretching of the toes, calf, and foot (by pulling up on a towel that is wrapped under the foot) are all helpful exercises to mitigate this condition. Taping has shown to be beneficial for plantar fasciitis. The IT band is a thick strip of fascia that originates on the outside of the hip and travels down the lateral aspect of the leg before attaching just below the knee. It plays a role in hip extension, abduction, and external rotation as well as stabilization of the knee. IT band syndrome refers to pain in the area caused by an injury due to repetitive use of the lower extremity in activities such as running, cycling, or weight lifting. Inflammation is the most common culprit and can be a result of improper form, muscular imbalances, and structural anomalies in the feet and legs. Kinesiotaping is a conservative means to help deal with IT band syndrome and can aid in reducing recovery time, allowing the athlete to resume their activities with less discomfort and more stability. KT Tape elects for a star pattern technique that focuses on the origin of the band while Rocktape uses a singular thick strip of tape to run along the IT band. The sacroiliac (SI) joint is the connection between the sacrum and the left and right ilium (hip bones). It is easily palpated in the lower back and right under the skin of the aptly named “back dimples”. Dysfunction in the SI joint can result in localized low back and sacral pain as well as discomfort into the legs. Causes include degenerative arthritis, direct trauma, leg length discrepancy, altered gait due to pain in the leg, and increased ligament laxity during pregnancy. Taping is an effective means to help the SI joints regain normal function and stability. KT Tape shows a method using a normal strip and two shorter ones while Rocktape uses a star pattern to achieve the same goal. Humans have 24 ribs, or twelve pairs, that help protect vital organs and aid in the contraction and expansion of the thorax when breathing. Of the twelve pairs, the first seven are deemed “true ribs” meaning each one has an individual cartilaginous attachment to the sternum. The last five pairs of ribs are “false ribs” because they either share a connection to the sternum or are floating ribs, meaning they only have a connection to the spine. Because of the integral role ribs play in everyday functions such as breathing, coughing, and laughing, any injury to them can take several weeks to heal. The area can’t be permanently stabilized as in the case of a broken arm in a cast because the intercostal muscles that are in between the ribs are utilized with the above mentioned actions and are thus always in motion. Applying kinesiotape can help add support and stability to the ribs without compromising their function. Depending on your comfort level with taping, KT Tape and Rocktape provide different methods. The former uses four regular strips that is easier to handle and apply while the latter involves a fan-like approach to tape the ribs. A common area of complaint in the general population is pain in the neck and upper back. A phrase frequently heard is “I carry my stress in my shoulders” and there is some truth to this saying. 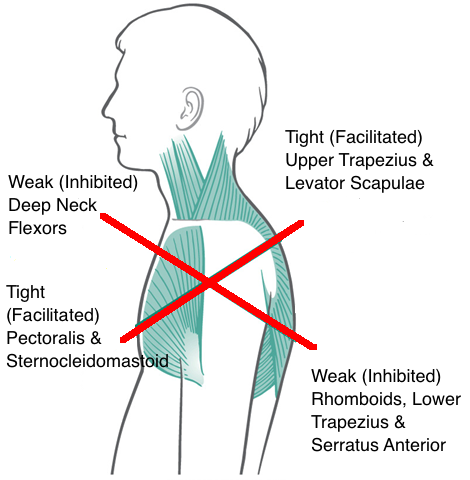 High stress levels or an injury to the area can cause a breakdown of proper posture in the neck and upper back. Instead of standing or sitting upright, the upper back starts rounding out, aquiring a hyperkyphotic posture while the head and neck travel forward into an anterior head carriage position. If the body is in this alignment for a prolonged period of time, muscles become overstretched and weakened. This can lead to tightness and tenderness in the upper trapezius and cervical paraspinal muscles, which run across the top of the shoulders and along the sides of the neck respectively. This produces a complex called the upper cross syndrome as pictured above. There are simple stretches and kinesio taping methods that can be used to help correct this detrimental syndrome as well as aid in symptom relief. Doorway and wall stretches are two of the most commonly prescribed routines. Taping is also quite straightforward as demonstrated by KT Tape and Rocktape. 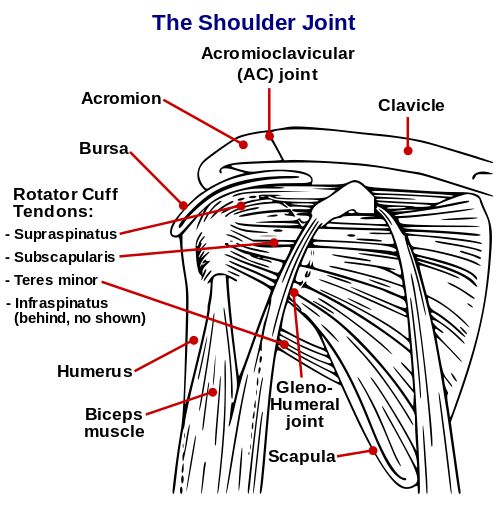 The rotator cuff is a collection of four muscles that help stabilize the shoulder. Other functions of this muscle group include arm abduction, external rotation, and internal rotation. The four muscles involved are the supraspinatus, infraspinatus, teres minor, and subscapularis. All have points of origin on the scapula and insert into the humerus (upper arm bone). Kinesiotaping of the rotator cuff muscles aims to help support and provide additional stability to the four named muscles, allowing the body to perform more efficiently in daily activities or in an athletic environment. It can also aid in the healing process of sprains, strains, or minor tears that do not require surgery. Even though the biceps gets the majority of attention when people envision muscular arms, the triceps brachii is actually the largest muscle group on the upper arm. Exercises such as push-ups, dips, and bench presses will all work the triceps, adding size or definition depending on your goals. With any strenuous workout, injuries are bound to happen and taping the triceps can’t be any easier. One strip of a kinesiotape of your preference is all that is required.